The use of herbal extracts in food & beverage launches has increased globally, featuring a +25% year-over-year growth when comparing 2018 and 2017 launches. In 2018, the top categories of global product launches tracked with herbal extracts were Supplements (14%), Soft Drinks (11%), and Sauces & Seasonings (10%), with Rosemary Extract being the leading ingredient among the ingredients tracked. The top health positionings of global product launches tracked with herbal extracts in 2018 were No Additives/Preservatives (18%), Gluten Free (15%), and Organic (9%). The use of marine oils in food & beverage launches is increasing globally, featuring a +3% year-over-year growth when comparing 2018H1 and 2017H1 launches. In 2018H1, the top category of global product launches tracked with marine oils was Baby & Toddlers (57%), with Fish Oil being the leading ingredient among the ingredients tracked. The top health positionings of global product launches tracked with marine oils in 2018H1 were DHA (35%), Digestive/Gut Health (30%), and Brain Health (27%). Weight management claims in food and beverage launches are decreasing globally, featuring a -13% year-over-year growth when comparing 2017H1 and 2018H1 launches.In 2018H1, the top category of global product launches tracked with a weight management claim is Sports Nutrition (31%), with Calcium (26%) being the leading ingredient among launches tracked with a weight management claim.The top health positionings of global product launches tracked with a weight management claim in 2018H1 are High/Source of Fiber (34%), Energy/Alertness (31%), and Sports & Recovery (30%). 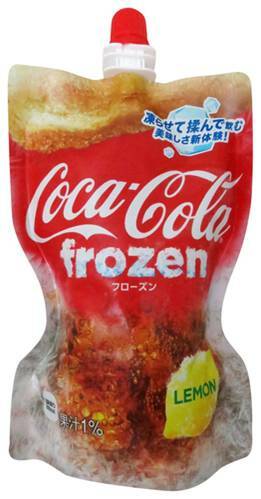 Frozen carbonated drink with lemon flavor, in a 125g plastic doy pouch. Sugar (mixed sugar solution), erythritol, lemon juice, trehalose, glycerol, flavor, caramel color, thickening polysaccharide, acidifier, magnesium sulfate, caffeine..